“I don’t do drugs. I am drugs” ~ Salvador Dalí. 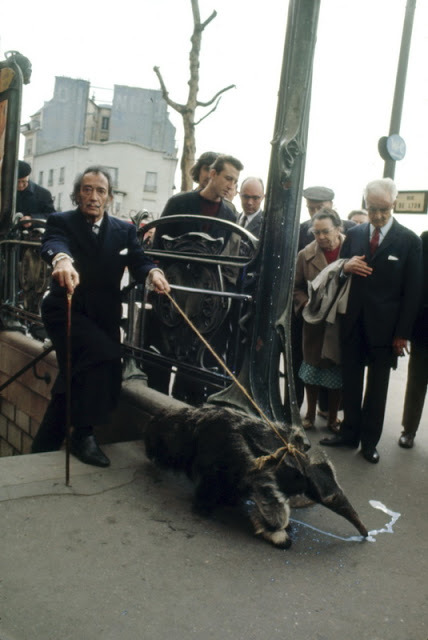 The photo, which dates from 1969, depicts the 65-year-old Catalan surrealist Salvador Dalí emerging from a Paris subway station led by his trusty giant anteater. Surrealism‘s aim was to “resolve the previously contradictory conditions of dream and reality.” Artists painted unnerving, illogical scenes with photographic precision, created strange creatures from everyday objects and developed painting techniques that allowed the unconscious to express itself. [from Wikipedia, link above]. [...] People should learn how to play Lego with their minds. Concepts are building bricks [...] V. Ramos, 2002. Time, not distance. Or distance as time. « Time, not distance. Or distance as time.